We love Italian food, but there aren't any Italian restaurants in Fall River. Thankfully, just over the Brightman Street Bridge is Ma Raffa's, a wonderful restaurant that our family has been going to for years. We've gotten takeout platters for holidays, treated family members to birthday dinners, and taken advantage of the restaurant's great dinner deals. 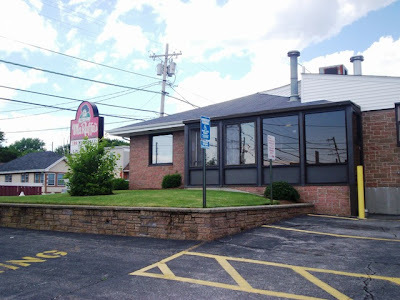 After Mom spotted a coupon for a buy one/get one free entree that was only good for that day, we decided that it was time to do an official review of Ma Raffa's. We pulled into the parking lot of the Somerset location at around 3:45 p.m., and to our surprise, actually got a space! This place is always packed. After walking up the oddly long cement stairs (people with short legs, a.k.a., Mom and I, are confused by them), we entered the restaurant and were quickly seated at a booth by the window. We were soon greeted by Liz, who has been our waitress on several different occasions. We ordered our drinks - two diet colas ($1.99 each) - and looked over the menu. Since the only specification on the coupon was that the entree had to cost $8.99 and under, we stuck to menu options that were around that price. Thankfully, there is a lot to choose from. 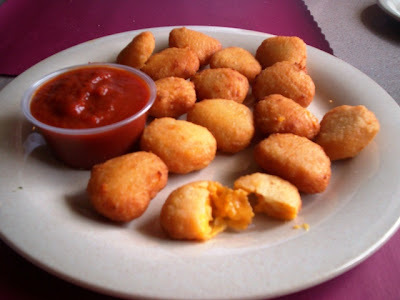 After picking our entrees, Mom told me about an appetizer which she had seen on the specials board that we had never had before - fried macaroni and cheese bites ($4.99). At first we were just going to stick to the entree, but since we were saving money by getting a free meal, we decided to walk on the wild side and order these bites. When Liz returned to the table, she took our order. Mom chose the spaghetti with meat sauce ($7.99), while I ordered the stuffed shells with tomato sauce ($8.99). We also went with the macaroni and cheese bites, which Liz said were very good. 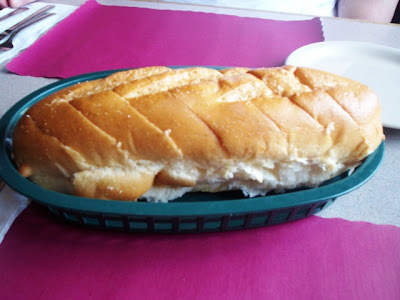 A few minutes after Liz left the table, she returned with a whole loaf of warm, delicious bread. The inside of Ma Raffa's is very pretty, but you wouldn't necessarily think that judging by the plain brick exterior. It has a good mixture of both booths and tables. It also has a lovely bar area where you could sit down and have a meal or a drink with friends. 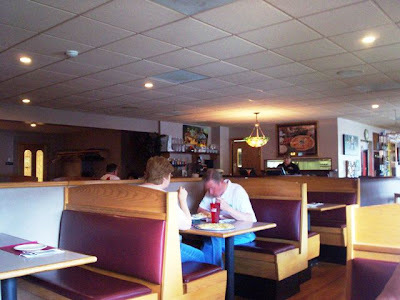 The staff is very attentive, and the restaurant is always very clean. Since we've seen so many of the same waitresses over the years, including Liz, we get the impression that Ma Raffa's is a great place to work. 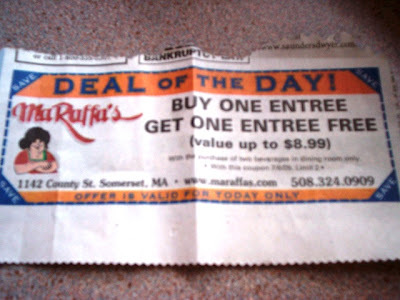 Mom also noticed that Ma Raffa's has been issuing a lot of coupons and specials as of late. We hope that this is simply to provide extra savings to the customer, and not because of the failing economy. We really want Ma Raffa's to stick around for good! After a few minutes of waiting, Liz brought over our appetizer. There were so many bites on the plate! We figured that there were going to be about five or six - not 15! Mom thought that they were going to be bigger, i.e., larger size/smaller portion. 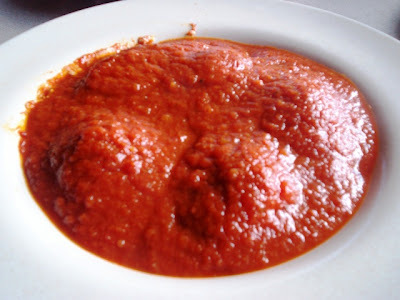 Accompanying the appetizer was a cup of marinara sauce for dipping. Now, both Mom and I found a little fault with these bites. Although they were tasty, there was too much cheese and not enough macaroni. Mom even cut one open and there was no pasta inside at all. We only felt that the taste improved when we dipped them in the sauce. It broke up that thick, cheesy flavor. What we did like about the appetizer was the batter. It was nicely thin and crisp. While we were still eating our appetizer, Liz brought over our entrees. They were both very fragrant and we couldn't wait to dig in. While we were eating, a man nearby mentioned that he felt that his meal had too much sauce. This does tend to happen sometimes at Ma Raffa's, although with Mom's plate, there was a perfect ratio of sauce to pasta because the portion of pasta she had was very large. When she got to the bottom of the dish, there was still some sauce left, and she enjoys that. The meat in the sauce is minced very finely, and the taste is very fresh. 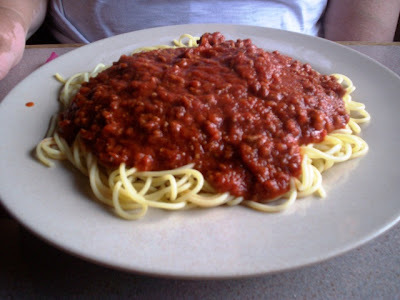 This is one of Mom's favorite spaghetti dishes. Hey! Where are my shells? That's pretty much what I asked Mom when Liz put my plate of food on the table. I could vaguely make out five lumps scattered around the bowl, and when I touched them with my fork, realized that I found the buried treasure. I definitely had way too much sauce on my plate. They should have drizzled the tomato sauce over each shell, but what can you do? My aunt actually asks for sauce on the side simply because some restaurants tend to overdo it. Once I found the shells, they were outstanding! I just felt bad that some of the taste of the ricotta filling was overpowered by the tangy tomato sauce. I ended up scraping off the majority of sauce to get to the pasta. What a great deal! We left $22 on the table for Liz, which included a 20% tip for the meal without the added entree. Oops. Etiquette says that one should leave a tip based on the bill without coupons. We forgot!!! Sorry, Liz! Before leaving, Mom and I decided to use the restroom. Like always, it was clean and neat. 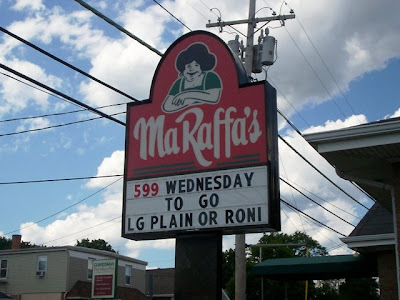 Mom and I have never been to the New Bedford location of Ma Raffa's, but we heard that it is just as great as the one in Somerset. Although we love coming here, they should really ease up on the sauce and let customers enjoy the great food that has made the restaurant a favorite of Somerset residents and those of us who live over the bridge. For more information, visit their Web site at www.maraffas.com.